Published: Nov. 24, 2012 at 12:02 p.m. Updated: Nov. 24, 2012 at 09:43 p.m.
Coach Bruce Arians knows his team has some major challenges this week. The Indianapolis Colts are 6-4 and are looking at their first must-win scenario with the remade roster. The Colts would have a wild-card berth if the playoffs started today. They need to keep the playoff-contending Buffalo Bills behind them, and Sunday's game presents a good opportunity for them to pull away from the Bills and other pursuers. Take a look at the best photos from Andrew Luck's career. The Colts' important game of the year comes at a time when rookies are starting to fatigue. And the Colts have rookies playing major roles all over the offense -- quarterback Andrew Luck, running back Vick Ballard, wide receiver T.Y. Hilton and tight ends Coby Fleener and Dwayne Allen. "We've got eight of them playing so we address it all the time," Arians said in quotes distributed by the team. "I started two weeks ago harassing them about the rookie wall and what to expect. It's more of a mental fatigue than a physical fatigue. They're all doing a good job of taking care of their bodies right now. They're running fast and doing those things. "It's the mental grind, and this is when the big boys play, December. What you did in November doesn't mean a daggone thing, it's what you do in December that they remember. These guy share a chance to do something special if they just stay in the moment and don't worry about the future. ... They're not rookies anymore. They've logged enough snaps to be second- or third-year players by now. So we don't consider them rookies anymore, so there's no such thing as a rookie wall unless you got here three weeks ago." Luck knows he's can't hit any wall. 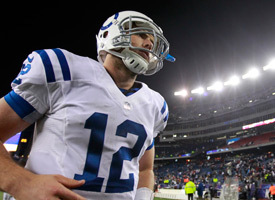 "I realize that I'm not allowed to feel it, especially with where this team is right now, what's at stake," Luck said. "It's been all right to this point. I think it would be a disservice to teammates if I started feeling sorry for myself, down and whatnot. "It's easy when you know what's at stake. Games are big. It's not too hard to get up for it and get prepared for it." Few expected the Colts to be in this position. Those rookies have to continue to play like veterans.